JOHANNESBURG (Reuters) - Johanna Ditsela lives within sight of the gleaming skyscrapers of South Africa's main financial district, but has existed in squalor for 30 years. 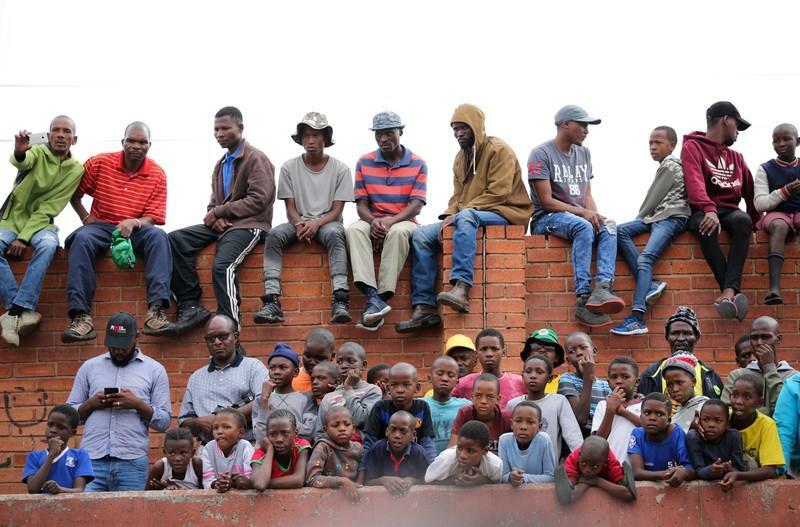 Ditsela's Johannesburg township, Alexandra, has seen protests against overcrowding and poor public services in the run-up to a general election on May 8. President Cyril Ramaphosa, who was campaigning for the ANC in Alexandra on Thursday, blamed the opposition Democratic Alliance party, which has controlled Johannesburg since 2016, saying: "It is upon the shoulders of local government to clean up this area." Ditsela, a lifelong ANC supporter, wasn't listening. She stayed at home rather than hear Ramaphosa, and like other residents of Alexandra, says she might not vote next month. "I normally vote, but the ANC is not doing anything for me, honestly," she said, sitting on a worn leather sofa in her shack and wiping away tears. "I need a job, and I need a house for my kids so that I can raise them in a dignified way." The ANC is expected to win another parliamentary majority next month, but analysts say its share of the vote will probably fall from the 62 percent it received in 2014. if turnout is low, it could lose control of Johannesburg's Gauteng province. A model of how Alexandra was meant to look once the project was completed - with parks interspersed between neat rows of houses - now gathers dust in a children's library on 3rd Avenue, its lights no longer working. Outside the library, ANC placards in the party's black, green and gold promising economic growth ring hollow. So, too, do those of the DA, which has failed to meaningfully improve many people's lives since it took control of Johannesburg. "We know that Ramaphosa has come to calm us down before the election," said Kgomotso Mosepidi, a 47-year-old technology specialist who waited to see Ramaphosa on Thursday - but found he had been whisked away by aides before she could get close. Both parties say an audit is needed to work out what went wrong. Johannesburg Mayor Herman Mashaba told Reuters the ANC had incited recent protests in Alexandra to smear the DA's reputation - a claim denied by the ANC. Khensani Yehova, a 43-year-old who sells fried bread, known as "fat cakes", for 1 rand (7 U.S. cents) from a roadside stall, lives in an old part of the township where her mother bought a house in the 1980s. She wants government to put the same effort into developing Alexandra as it does the more famous Soweto township, where tens of thousands of tourists flock every year to the former home of Nelson Mandela, South Africa's first black president. Mandela lived in Alexandra too, but few make the journey there. As Yehova says: "Officials don't take Alexandra seriously."